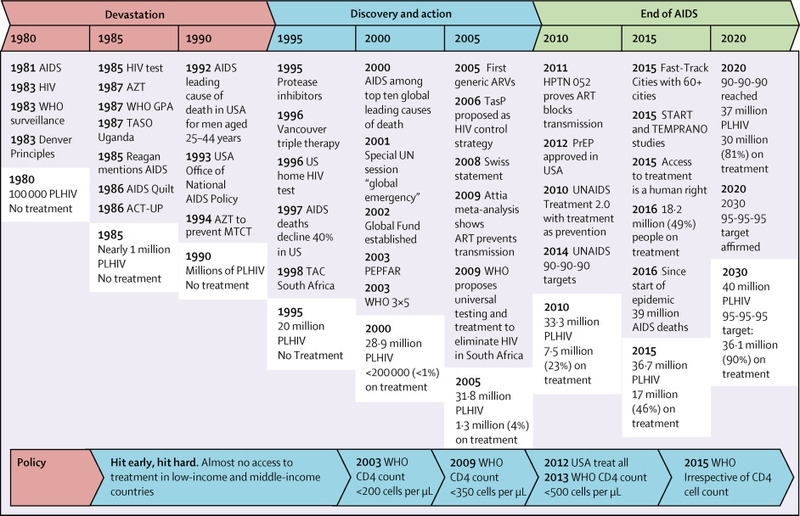 Although its history is complex, the HIV pandemic can be characterised by three phases: devastation; discovery and action; and ending AIDS (figure). The initial response was defined by overwhelming devastation of marginalised individuals and their communities, the root causes of which were widespread denial, ignorance, stigma, fear, and neglect. It was a time when affected communities and beleaguered health-care providers struggled in isolation to minister to the sick and dying while governments, experts, and other authorities exercised little if any political will to address a burgeoning health crisis or exacerbated the crisis through their policies.4 Out of this suffering emerged a determined community response that demanded leadership and resources from governments. The discovery and action phase resulted from the growing community, scientific, and political response that unravelled the secrets of HIV. Despite remarkable progress, the accepted wisdom was that ending AIDS was not feasible without a vaccine or cure. Without effective treatment, the focus was on prophylaxis and treatment of opportunistic illnesses, palliative care, ensuring human rights, tackling stigma and discrimination, community support for people with HIV, and prevention methods.5 The development of life-saving, triple drug therapy in 1996 gave hope along with the realisation that most of the people infected with HIV lived in low-income countries and it was morally unacceptable to deny them treatment.6, 7 The creation of the Global Fund to Fight AIDS, Tuberculosis and Malaria in 2001 and the US President's Emergency Plan for AIDS Relief (PEPFAR) in 2003, the Millennium Development Goals, and the launch of WHO's 3 by 5 initiative, signalled the translation of discovery to action. In the face of considerable scepticism, antiretroviral treatment was delivered at scale and it was subsequently shown that ART leads to a near normal disease-free lifespan and virtually eliminates the risk of HIV transmission.8 By 2006, the old “test and wait” strategy of withholding antiretroviral treatment until people's immune systems were severely compromised no longer made sense. These and other developments provided the foundation for the next phase of the HIV pandemic—ending AIDS.